Fluxus, a loose association of Dada-inspired avant-garde artists that developed in the early 1960s, was active in New York and Europe. Ono visited London to meet artist and political activist Gustav Metzger's Destruction in Art Symposium in September 1966, as the only woman artist chosen to perform her own events and only one of two invited to speak. Her first contact with a member of the Beatles was when she visited Paul McCartney at his home in London, in the hope of obtaining a Lennon–McCartney song manuscript for a book John Cage was working on, Notations. 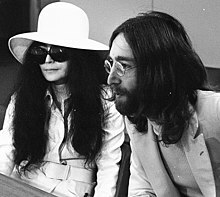 McCartney declined to give her any of his own manuscripts but suggested that Lennon might oblige. Lennon later gave Ono the original handwritten lyrics to "The Word". 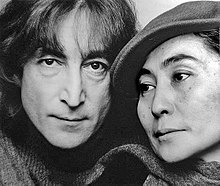 Ono and Lennon first met on November 9, 1966 at the Indica Gallery in London, where she was preparing her conceptual art exhibit, and they were introduced by gallery owner John Dunbar. 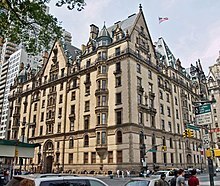 Lennon was initially unimpressed with the exhibits he saw, including a pricey bag of nails, but one piece, Ceiling Painting/Yes Painting, had a ladder with a spyglass at the top. When he climbed the ladder, Lennon felt a little foolish, but he looked through the spyglass and saw the word "YES" which he said meant he didn't walk out, as it was positive, whereas most concept art he encountered was "anti" everything. 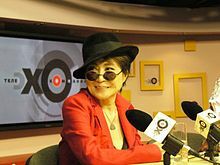 During her career, Ono has also collaborated with Earl Slick, David Tudor and Richard Maxfield. As a dance music artist, Ono has worked with re-mixers/producers including Basement Jaxx, Keiji Haino, Nick Vernier Band, Billy Martin, DJ Spooky, Apples in Stereo, DJ Dan, Craig Armstrong, and Jorge Artajo. ^ Taylor, Paul (February 5, 1989). 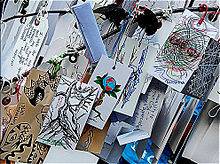 "ART; Yoko Ono's New Bronze Age At the Whitney". The New York Times. ISSN 0362-4331. Retrieved March 4, 2019. 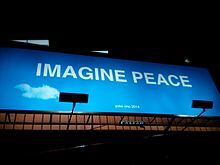 ^ "Yes Yoko Ono". Japan Society. Retrieved March 4, 2019. ^ a b Miles 2001, p. 246. ^ a b c d e f g Williams, Precious (May 19, 2002). "Eternal flame". The Scotsman. Edinburgh, UK. Retrieved April 19, 2019. ^ Newhall, Edith (October 2000). "A Long and Winding Road". ARTnews. p. 163. ^ Phelan, Peggy (2007). Butler, Cornelia (ed.). The Returns of Touch: Feminist Performances, 1960-80. Los Angeles: Museum of Contemporary Art. p. 350. ^ Concannon, Kevin (2011). Joan M. Marter (ed.). The Grove Encyclopedia of American Art, Volume 1. Oxford University Press. p. 596. ISBN 0195335791. Archived from the original on February 17, 2018. ^ "Art in the Garden Program" (PDF). Fairchild Tropical Botanic Garden. Retrieved March 4, 2019.